Did you ever finish decorating a room and know in your heart it’s not right? But you spent all this money and put in a lot of effort so you try to ignore the voice inside. Maybe you focus on the lovely aspects, which are inevitably there and look past the imperfections. Do you dare change it? Again? Such was the case with my master bedroom, a room I spend a lot of time in. I wanted it to be right. I wanted it to be a place I go to for recharging. And reflection. And inspiration. But every time I photographed the room, I knew I hadn’t gotten it quite right. I tried the breakfast nook at the foot of the bed. And I love that focal point, but the rest of the room just wasn’t working. And then one day I was just updating the bedding to freshen up for summer. And bam! There it was. It was working. And everything flowed from there. Today I’m delighted to be joining with 8 other bloggers as part of the Seasonal Simplicity summer home tour, hosted by Krista from The Happy Housie. We’re sharing the simple seasonal touches we’ve added to our homes for the summer. If you’re coming over from On Sutton Place and you’re new to my blog, let me extend a warm welcome. I’m sure you enjoyed Ann’s wonderful post. Of course, I’m thrilled to welcome my regular readers, as well. Please be sure to take a peek at the other tours linked at the bottom of this post, too. 1. White linens – This is what started it all. 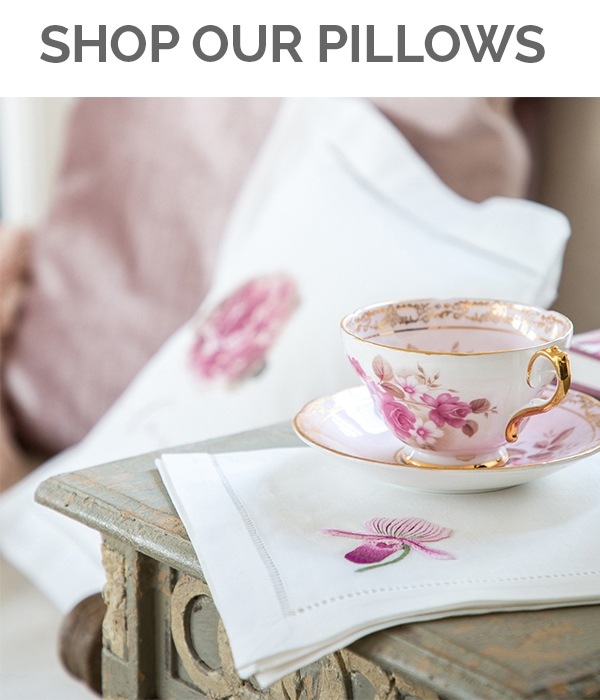 I had gorgeous French bedding from D. Porthault in a pretty floral pattern that I loved. But it just wasn’t working for the room. Either the dark furniture and wall paint had to go or the pattern did. 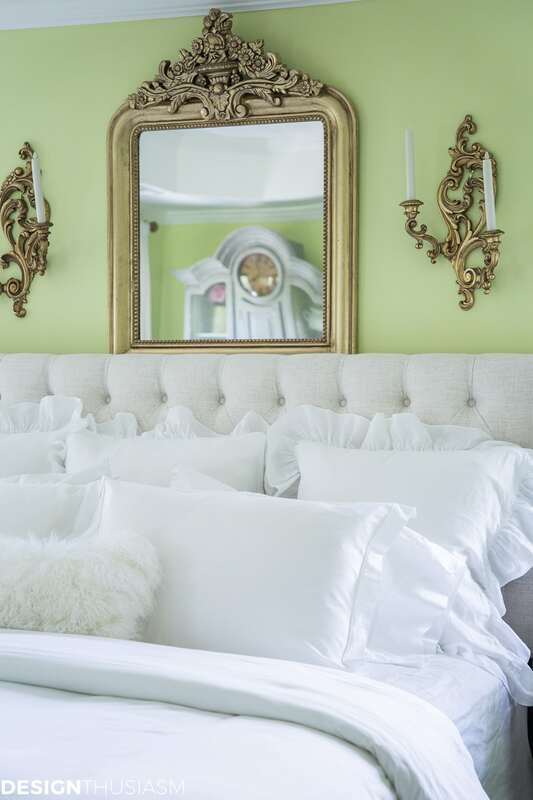 I lightened up the bedding and went all white to welcome summer, but the difference it made was transformative. It has a softness that I just love. I am a white dish and towel girl, so this is not surprising. But I do love the spa effect it offers. And it led the way for all of the other changes. 2. Gilded mirror and sconces – Next on my list was to move the vibrant paintings that were above the bed to a side wall and replace them with an ornate gilt mirror. 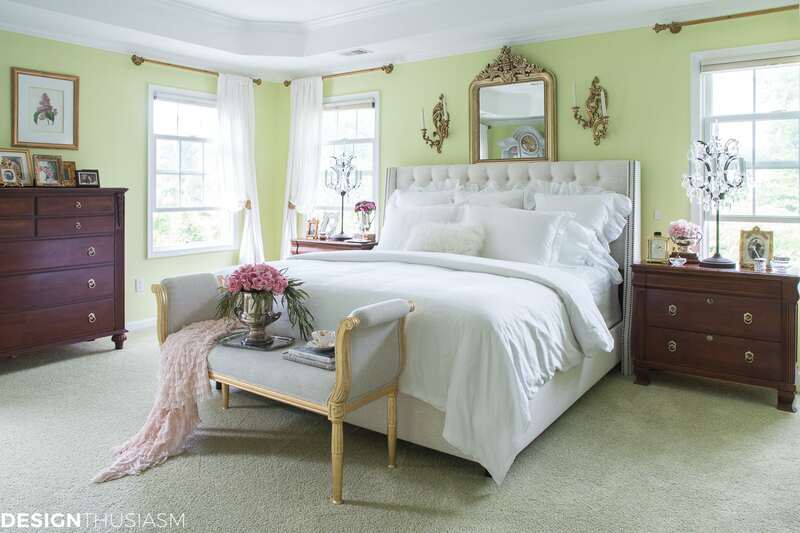 I had already replaced the dark headboard which you can read about in THIS POST, and the relationship between the gilt pieces and the white linens is the essence of this room. Everything else services this relationship. I added the pair of sconces that had been in my parents’ home. 3. 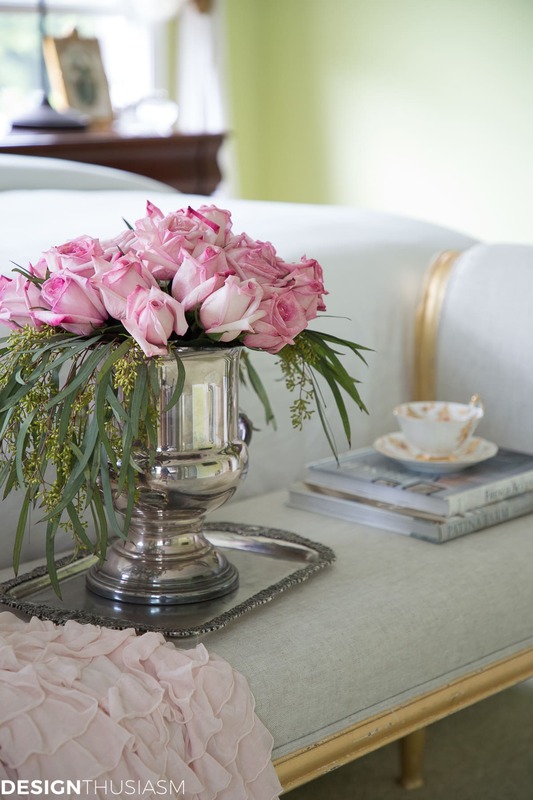 Seasonal flowers – There’s not a post I do where flowers are not on the list of styling elements. The colors and blooms change with the season, but the concept does not. I include flowers in my grocery budget and perceive them as the easiest way to add seasonal flavor to a room. In this room I used mid-tone pinks and they became the key accent color for the room. 4. 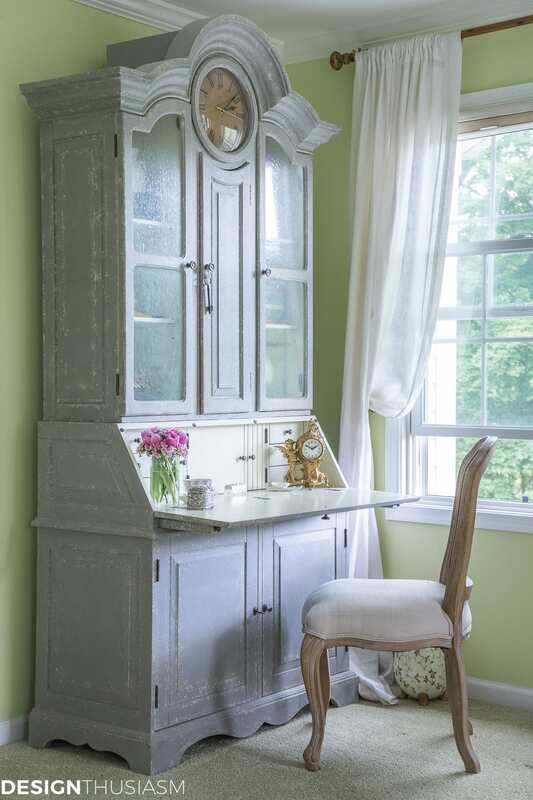 Painted furniture – This piece has actually been here for a few years, but this corner serves to illustrate how lovely soft paint colors play off the white linens and gilded details. 5. 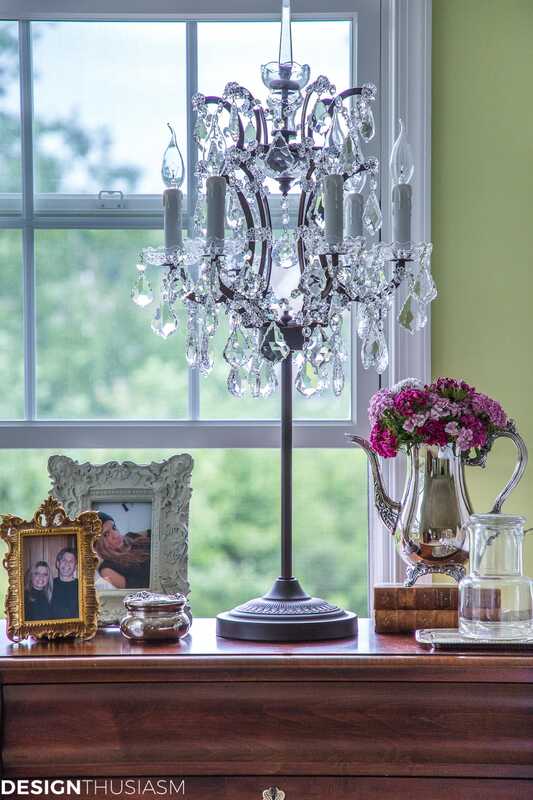 Crystal chandeliers or lamps – Another key change in this space was replacing the more traditional lamps with these crystal ones. I knew I wanted crystal in the room and there was no place for a chandelier, so the lamps became an important style element to play off the white and gold. They reflect the summer light that streams into the room and the light play off the wall is utterly magical. 6. 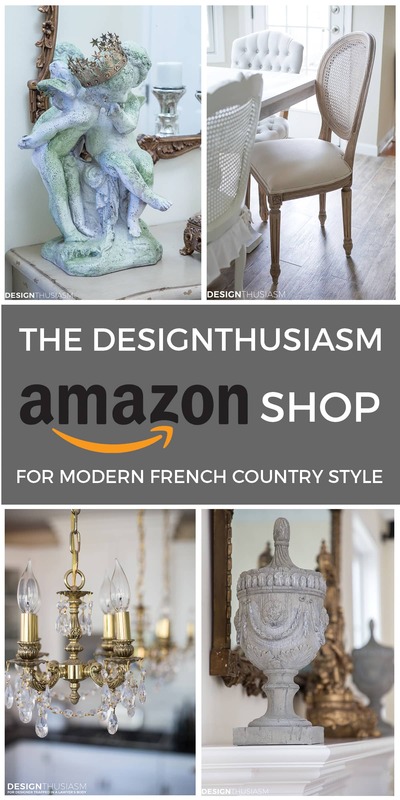 Feminine French accessories – Once the updated larger pieces were in place, I moved on to styling with accessories. 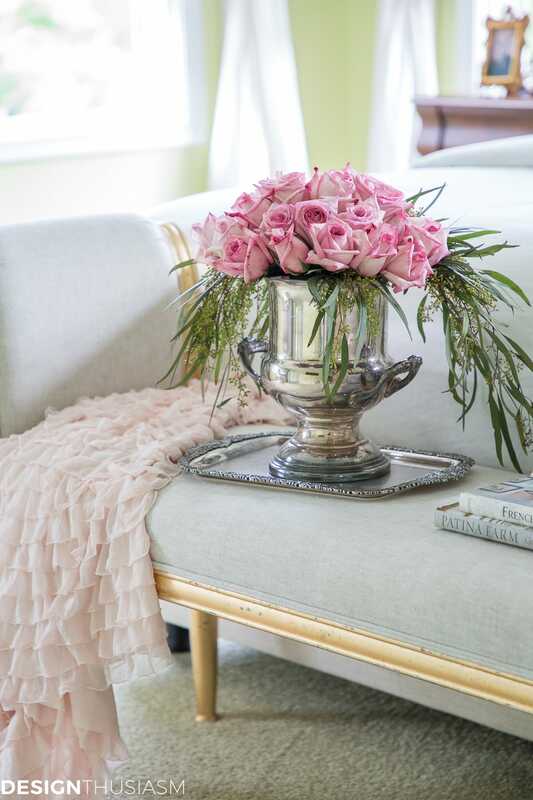 From vintage silver and gilt pieces to design books, vintage china and a ruffled throw, the deliberate placement of gorgeous older pieces helps ground the newer items and keeps them from looking “canned”. 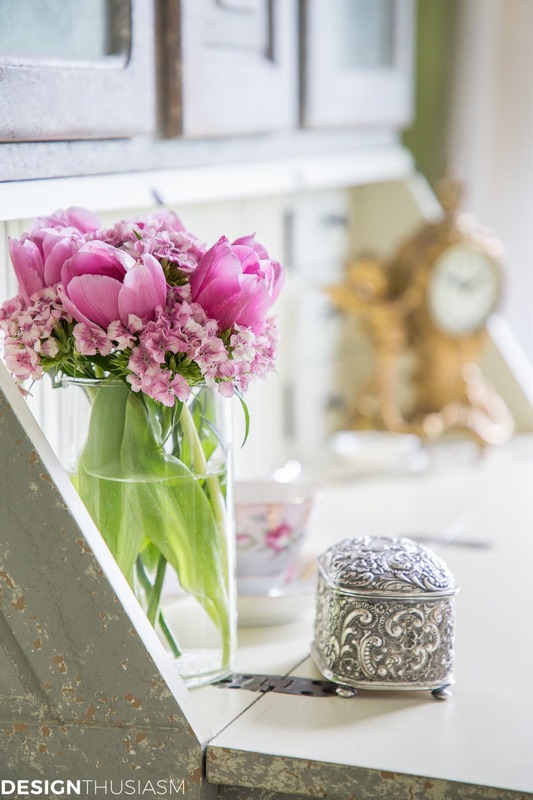 Antiques are present in all my rooms and they’re what make a space individually unique. 7. 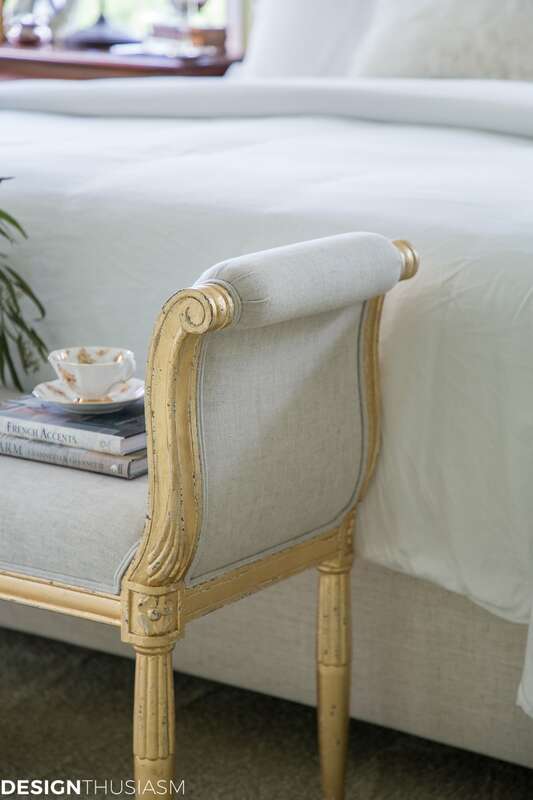 Gilded French bench – This room was complete a few months ago, minus the bench. And I knew it simply wasn’t ready to reveal. Because despite the fact that it’s just one little piece, it’s the crowning touch really. 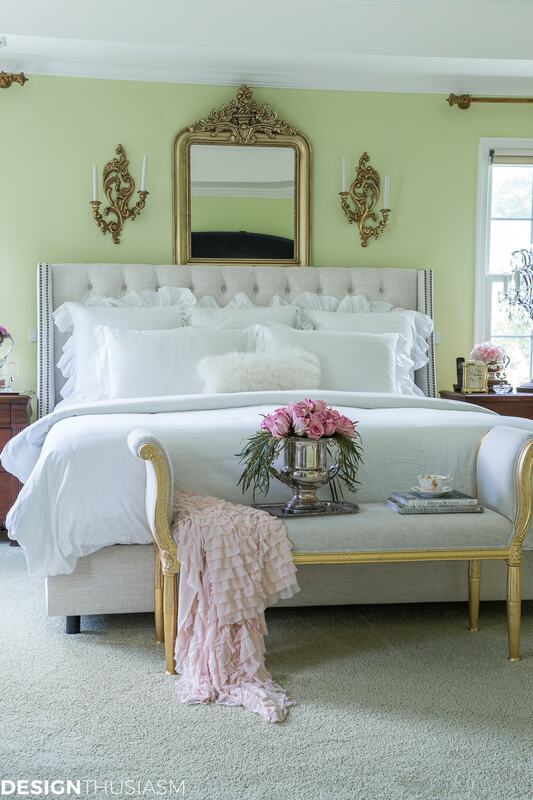 It gives finish to the bed and works perfectly with the modern French look of the rest of the room. But more notably, it’s also the staging ground for the seasonal decor. 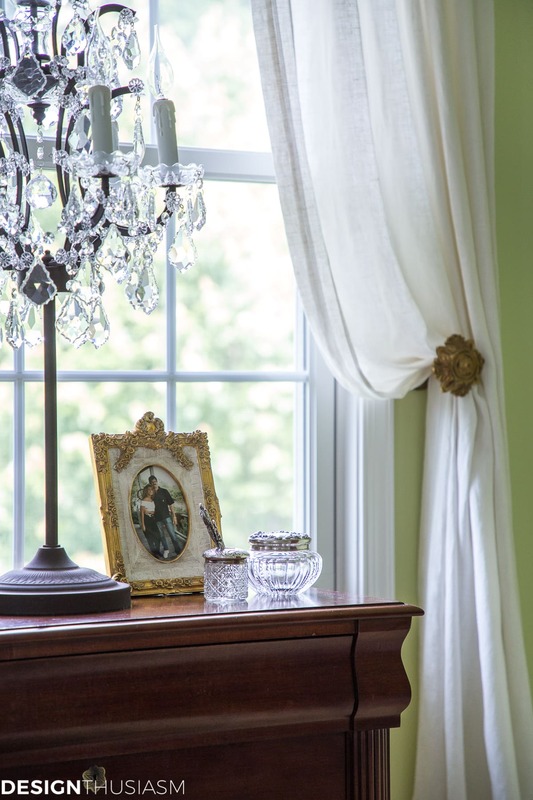 A front a center space to display summer florals and a lightweight throw, in fall it will host a chunky knit, russet blooms and perhaps a pumpkin or two. As always, I know I’m not done. There are still parts I’d love to change (I’m looking at you dark wood!) and refinements I’m already thinking about. But what a pleasure it is to come home to this room and feel it’s a place I can relax and refresh. After all, that’s what creating a home is all about, isn’t it? Master Bedroom Ideas Source List – To get the look, click on the items below for direct links to the products. Where actual items were no longer available, I’ve provided similar options. Next up on the tour is my friend Annie from Zevy Joy. She is so talented and I know you will enjoy her delightful style! Please enjoy the other posts linked below, as well! Beautiful room, Lory and I love the puddling drapes and tiebacks. Thank you so much, Ilene! I thoroughly enjoy your sense of style and design. You usually hit the mark . But trust your first instinct about the wall color. It doesn’t really seem quite right. The mirror also seems a bit crushed between the top of the bed and the ceiling. I love the bed, drapes and the bench at the foot of the bed. Thanks for the input, but I don’t agree with you on this one. I’m a white dishes, sheets and towels girl myself, so I can totally relate. Love the gilded pieces and how they relate to the white. I rather concur with Nancy that this spot does not do justice to this gorgeous mirror. I love the Louis Philippe-style nightstands. It has beautiful lines, and they relate very nicely to the mirror. Lovely room. Your wall color is so refreshingly not gray. It’s like the breath of springtime! Love the contrast of dark furniture with light colors. So pretty and frenchy! Your bedroom is absolutely gorgeous! I loved each of your tips. I too know the feeling of completing a room and not having it quite right. I’m so relieved to know I’m not the only one. Thanks for sharing your beautiful room with us! Such a lovely space! Those white drapes just feel so summery to me. LIke they are swaying in the breeze. What a beautiful bedroom, Lory! 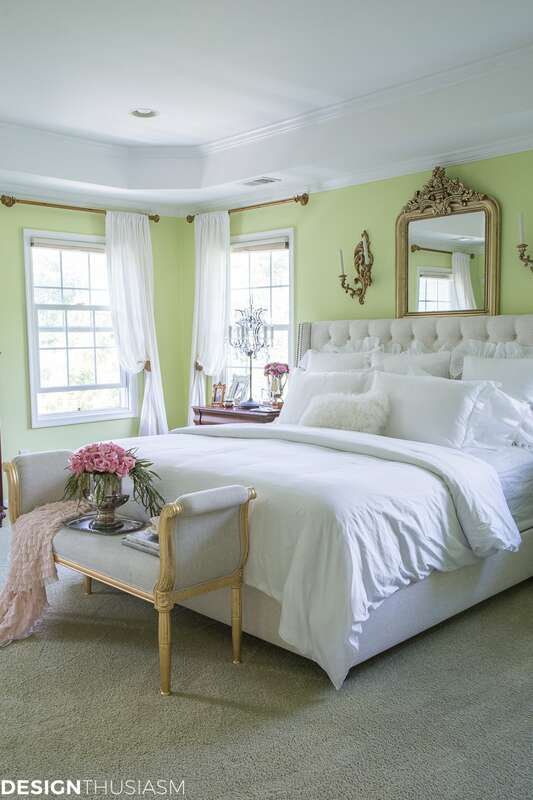 Love the wall color with the white linens. So refreshing. Beautiful bedroom! I love the secretary with the clock in it. How unusual! Thank you!! That piece is from Soft Surroundings, but they seem to have discontinued it. Its a shame because it’s one of the pieces I get the most comments about. So beautiful, Lory! I love your headboard and that stunning bench! Great tips! So glad you could be part of this tour! The white linens look absolutely gorgeous Lory! Wow – they made such a difference in the space!! This is just gorgeous, Lory. What a beautiful place to relax in. I wouldn’t want to leave! It’s lovely! My favs are the bedding and gold gilded pieces. My perspective–I would prefer to paint the walls (the green feels too light and cool) than the dark wood furniture. (Probably because it’s much easier to paint walls!) I can envision a slate/peacock/teal color looking lovely with all of your pieces. It would feel so rich. Clearly, it’s your house, your style and your $$! And your vote that counts! Just noticed this comment. Gosh, I’m so behind. But yes, I do love it!! Thanks so much for the kind words, Summer! Lory, I love all your gilded touches. Very pretty. For me, the beautiful green wall paint is so refreshing and a perfect back drop for everything! Fabulous!